A Scatter chart is a set of individual points on a two-dimensional chart. A scatter plot has two axes, showing one data property along the horizontal axis (x-axis) and another along the vertical axis (y-axis). It can accept only one data series. Let’s start to create a Scatter chart yourself step by step. It will be a simple Scatter chart and you can improve it at any time by adding additional functions and properties. First, we will make some preparatory steps. 1) Specify data that will be presented in your chart. In our example we will use measurement data (in JSON format) of some physical quantity that can exist in 3 states (type A, type B, type C). Learn more about available data formats. 2) Insert an HTML container for your future chart to the page e.g. with the name "chart_container" . Go on, fill in an object constructor. 3) Set chart type (value 'scatter') in the property view. 4) Define value 'chart_container' in the property container of an object constructor. It specifies the chart container. 5) Assign value '#a#' to the xValue property to set x-coordinates of the chart. 6) Assign value '#b#' to the yValue property to set y-coordinates of the chart. Other parameters are optional, choose them according to your needs. 7) Specify points tooltip e.g. value '#type#' (property tooltip). 8) Select outer, inner color of items markers and their shape (attributes 'borderColor','color' and 'type' of the item property). 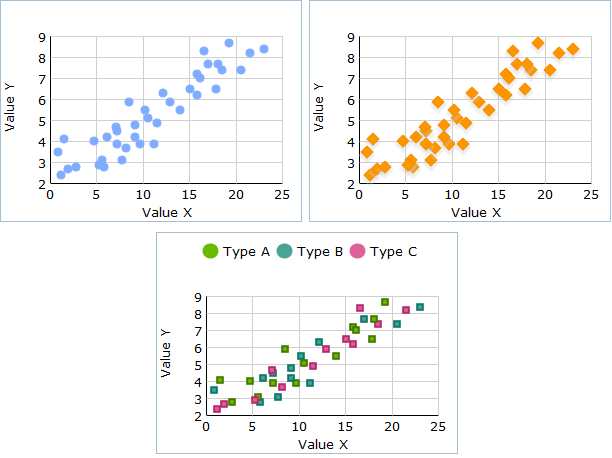 9) Name xAxis and yAxis (scales values in scatter plots are calculated and set automatically). Learn more about chart scale here. 10) Use method parse() to process data.